If you’ve ever liked the Transformers then you’ll like this case. The Marware CEO Classic iPod case has many identities for many different personalities and lifestyles. Made of stylish full-grain leather and hand stitching, this case does have a few surprises. Marware have come up with a unique design yet again. Iï¿½’ve not seen anyone do this with an iPod case design but it’s a cool idea. In the box you get the leather holder for the iPod (fits all models old or new apart from Nano), this on its own is one case. The vinyl screen protector allows your iPod screen to be visible in all conditions; the scroll wheel is left open-air so you can retain full functionality. At the top you’ll find the headphone jack and hold switch areas left exposed for easy access. At the bottom you’ll find the data port exposed as well. Your iPod is still well protected so fear not. So that’s the first part of this case. And if you’re perhaps using this case around the house, this will keep your iPod scratch-free and give it a luxury sentiment. The second attachment is the lid with pocket. 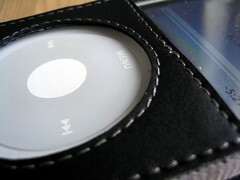 The attachment is secured in to place using buttons on the back of the main iPod holder described above. Two buttons on the top back and one button at the bottom back of the main case are used to secure the lid. To open up you just unbutton the back bottom of the case like many other iPod cases. You see where I’m going with this? Again the material is high quality leather with hand-stitching. This attachment keeps the whole iPod safe and secure. It covers up the hold switch (which you wonï¿½ï¿½ï¿½t need anyway since the lid keeps you from touching the scroll wheel) and data port but naturally leaves the headphone port open so you can listen with the lid closed. That pretty much sums up the first attachment. The second attachment is a bit different. Again attached using buttons on the back but this one isn’t strictly a lid. It is a fascia protector for the iPod. You have full access to the iPod scroll wheel and hold switch/headphone jack. 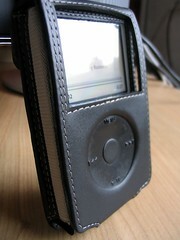 The scroll wheel is not exposed, it is made of the same leather material but has the wheel designed in to it so you can still do your normal iPod operations whilst this case is on. This makes the attachment almost the same as having the main case but with the added protection of the scroll wheel, data port and top edge of the iPod. All three parts to this case have their own unique identity, look and feel. They’re all made to a high quality standard and keep your iPod safe and secure with its own distinct look. The lid with pocket is my favourite out of the three as it does have a small pouch at the front for storing your ear buds. Its credit card sized so you could even pop a card in there. This one offers the most protection and makes it less obvious you own an iPod as well. The second attachment didn’t really turn me on that much. The rugged leather look was appealing but I had trouble using the scroll wheel due to the thick leather they’ve used for this portion of the case. Other than that though, it does offer the best of both worlds since it has that leather attractiveness but uses an open styling for access to the screen and scroll wheel at all times. Great design if you can get used to the scroll wheel. Largely this three in one case is a great idea and I would recommend it to those who use their iPod for different things or you just fancy a change every now and again. 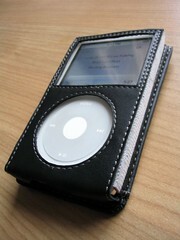 The classy elegant look with the luxury leather will keep your iPod snug and safe. I think Marware deserve a TechCast Recommended award for this one and sure as anything they get it! Copyright © 2019 a chocolateco.co creation. All rights reserved.